This photographer's studio is now a magical version of Santa's workshop! It's the most wonderful time of the year — especially for those lucky enough to visit Santa's workshop. Phil Kramer, a photographer in Philadelphia for more than 30 years, decided to turn his studio space into a magical Christmas experience for the first time this year. 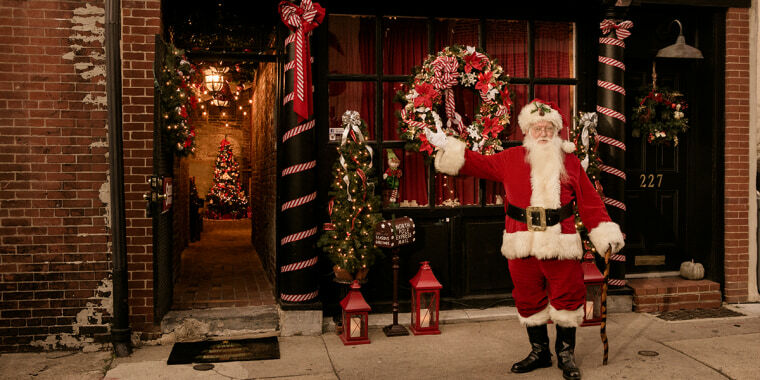 Old City Santa is all about creating opportunities for gorgeous family photos with the man in red — but it's also an experience to remember. "We just kind of started decorating ourselves and it worked out pretty cool," Kramer told TODAY Home. "Families come in, and the space is so unique. It’s old and it’s brick and it has the old hardwood floors — it’s 100 years old or more." With his son, Evan Kramer, and the studio's other manager, Mimi Janosy, Kramer created an entire experience that's so much more than just a holiday photo session. "Families come into the courtyard and we have a storyteller explain why Santa is in the city," Kramer said. "We bring the kids in and they write letters to Santa and then we bring them into the studio. We pull the curtain back and there he is." Kramer and his team worked hard to come up with the idea for the space, investing around $4,000 in carpentry and decorations for the space's transformation. But that's not all: Kramer says that while his team will take photos of the kids and families with Santa, they will also do portrait sessions in the courtyard, where families are invited to enjoy cookies and hot cocoa after sharing their wish lists with Mr. Claus. "A mother text me and said, ‘My son thinks he was at Santa's workshop. Thank you,'” said Kramer. "That makes it all worth it."